The price of the average three-bed semi in County Leitrim rose by 7.5% to €114,000 between June and September, the biggest quarterly increase nationwide, according to a national survey carried out by Real Estate Alliance. 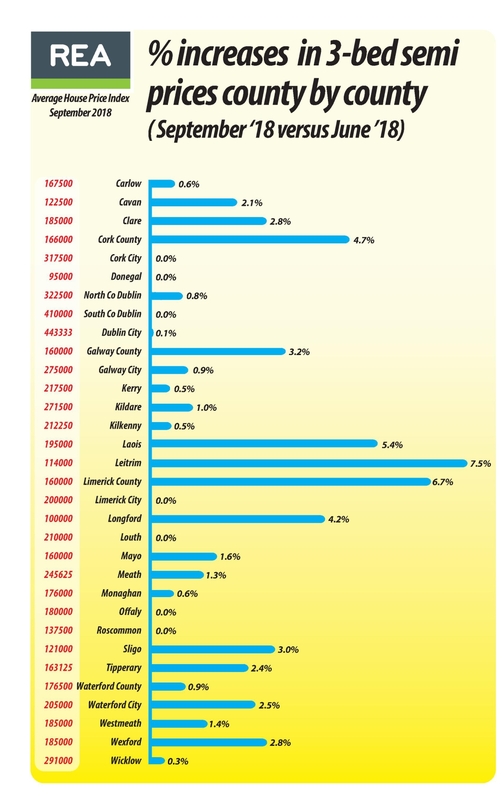 County Leitrim prices have risen by 16.9% in the last 12 months, the survey found. “There has been a distinct increase in activity since the end of August, with a significant rise in enquires, viewings, offers and sales,” said Joe Brady of REA Brady in Carrick-on-Shannon, where the average price of a three-bed semi is now €148,000, up 4.2% this quarter. “Supply is very limited and a high demand has seen an increase in prices,” said James Spring of REA Peter Donohoe, Carrigallen. He reports an increase locally of 14.3% in the price of a three-bed semi to €80,000.